Heat water in a tier steamer. Season the couscous, then toss with 1 tsp oil. Pour boiling water over the couscous so it covers it by 1cm, then set aside. When the water in the steamer comes to the boil, tip the broccoli into the water, then lay the salmon in the tier above. Cook for 3 mins until the salmon is cooked and the broccoli tender. Drain the broccoli and run it under cold water to cool. Mix together the remaining oil and lemon juice. 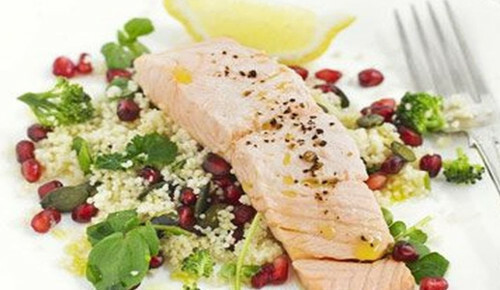 Toss the broccoli, pomegranate seeds and pumpkin seeds through the couscous with the lemon dressing. At the last moment, roughly chop the watercress and toss through the couscous. Serve with the salmon, lemon wedges for squeezing over and extra olive oil for drizzling, if you like.